It is the year 2109, the world has sunk into disarray and destruction. The zombie apocalypse has taken over, destroying nearly a third of the Earth’s population. Left behind are soulless, flesh-eating creatures that mindlessly roam the streets in search of brains, human kinds being the specialty. The few that were lucky to survive the outbreak have been forced to board up their houses, carry weapons, and stockpile as much food as possible. Learning how to defend oneself against a zombie attack is the key to surviving in this wretched world. Hope for a cure is small, super expensive, and highly unlikely. Does this sound familiar to you? It’s the typical way in which the zombie apocalypse is pictured. 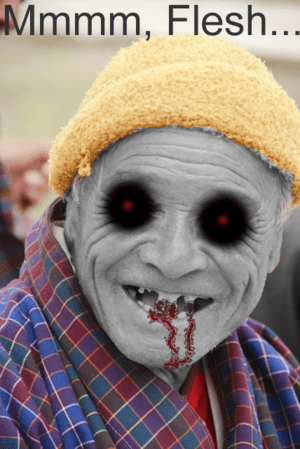 Zombies are usually thought of as vile, disgusting things that never sleep, move with a shuffling style unless agitated and can only speak with moans and groans. These zombies are ruthless and anyone that crosses their paths unarmed is in for a real fight. Of course, everyone knows zombies are not real and the chances of a huge zombie outbreak happening are minimal. First of all, and I got this from a documentary, a major zombie outbreak like the ones described in many television shows and movies would require such a lethal amount of viral infection, the likes that have never been seen anywhere on Earth. The documentary said the only virus that could possibly spread and infect billions in a small amount of time is a highly modified rabies virus, and even then it would still be very unlikely since a normal virus takes a few hours to days to incubate. A normal rabies virus takes a few hours to run its course on one human body, most of the time ending in death, and spreading to not just one but billions of people quickly to create a major zombie population would be highly unlikely, but not impossible if the rabies virus existed in many countries at once. The zombie population would have to survive long enough for humans to really feel like there was a challenge on their hands, not one that can be wiped out so easily. Also, to create a zombie some portion of the brain has to be retriggered from the disease, leading to a dead body that is basically a walking shell of its former self running on minimal brain power. It would sort of be like stripping a computer of all the main programs and files that make it work and leaving only the most basic things like a calculator and a place to write in codes. Not much to live on, eh? (walk, eat, make incomprehensible sounds). So what if the zombies could somehow learn things and return to human form, living normal lives again, like being resurrected? The movie Warm Bodies showed the journey of a zombie that was half-human and, unlike his dead counterparts, found love on the street, and came “back to life” with this person. Warm Bodies tells the story of how the once flesh-hungry zombies turned into functioning people again with emotional connections to one another. It was one of the first “zombie romances” I had ever seen, completely flipping the zombie genre on its head and spinning it around a few times, crashing it into a wall. Of course, zombies are sub-dead human beings, so how can they speak English and have emotions and attractions when those traits are supposed to have been long gone? They can’t just come back just because a zombie looks at himself in the mirror or sees two people holding hands. It’s a comedy/drama, I know, but some things were so farfetched. Zombies don’t have full control over their muscles so how could R, the lead character, move the needle for the record player, open the door to the plane, or even drive a car? Again, it’s a comedy and shouldn’t be taken seriously. It’s based on a book and I imagine the writer was simply trying to put zombies into a different light because, believe it or not, they were once humans like you and me. Did I mention the film was hilarious by the way? Anyways, if people really could come back to life as zombies, maybe they could live among us, just with different needs and styles of living. Maybe the virus that makes them zombies wouldn’t make them so much like monsters but more like a person that came back from the dead to start a new life. If we could somehow speak to these zombies and make them understand, maybe they could be taught how to speak again and learn things. They could eat the same things as us, and do the same fun activities,developing that human part of their brain that had been lost. Or maybe…the zombie could be like a pet dog or cat, and roam around the house keeping us company, doing things a regular pet would do. We could even take the zombie out for a walk once in a while. I’m just speculating, ha ha. If I was a zombie I would feel, if possible, very angry at the way my kind have been treated even if we have to be shot down because we get out of hand. I would be thinking, “Damn, these humans think they so big and bad and they treat us like garbage, they deserve our revolt against them”. I would tell all the other zombies to stand up for themselves and at least prepare a little better against human attacks (wear some body armor or head masks or find a way to carry and use firearms). If zombies had their own country, they would want equal rights just like everyone else. They would like to hoist their own national flag to praise and honor. They would like to watch their own TV shows and listen to their own zombie music (if groans and moans could be made into a tune). Instead of Hollywood, there would be Zombiewood where famous zombie movie stars and the like hang out at exclusive clubs and parties. Instead of zombies being the villains in every film about them, in Zomb they would be the things everyone is rooting for! The humans would be the enemies and what a great way to turn the tables. You know the video game Plants vs. Zombies? Well, in this case, it would Zombies vs. Plants since the zombies would be the heroes being controlled by the player. Different customizations and items could be unlocked to build an army of anti-plant fighting creatures. Other video games could follow this same path, where the villains are now the heroes and vice versa. What about zombie politics? Every four years or so there would be an election for the next zombie President or whatever the leader would be called. Or maybe there wouldn’t a true leader and it would be a free for all, do whatever you want country. Imagine zombies having their own sports teams to root and play for. Like the Corpsetown Zombies or Hellside Undead. They could participate in the Olympics too and would probably win a lot because all the real human competitors would get scared and run away – except the ones with shotguns! If zombies had their own dance it might be called the Creepy Shuffle or Graveyard Step. Hey, there’s a new kind of music in town, it’s called Dead Rock! I would so be a fan of the sensational Deadman Balmer or the hit band Zombies at War. The living dead would have their own Zombipolooza where all the top undead acts come together to groan and moan in celebration of a great day of music. And I almost forgot the fashion industry, if zombies ever had any interest in that sort of thing. Just imagine a zombie shuffling into a store and grunting at the owner that he wants to buy that new tattered, blood stained shirt on sale. Who cares about money in Zomb? If the zombie doesn’t get what it wants it will just eat the thing standing in its way! I know, this is all silly talk and not realistic but it’s still fun to think that zombies could have their own culture and society if they were ever smart enough to have one. Zombies should have a chance to be the good guys, er…once in a while at least. So sign the petition today to give zombies equal rights! It will benefit the world in great ways and help cut down that dividing wall between the living, the living dead, the living masquerading as dead, the dead, the not-so-dead, the some-what dead, the deader-than-dead, and the deader-than-door nails kind of dead. If you were the new leader of your country and had the chance to transform something that’s currently an annoyance (or worse) into a very fun activity, what would it be? How would you go about the change, and why would you choose that particular thing?